First brewed back in 1997, Saint Arnold's Oktoberfest is the company's popular fall offering. While a somewhat traditional Oktoberfest beer, it has a bit of a trick up its sleeve. Initially planned to be a lager (standard for the style), a test batched brewed with the company's proprietary ale yeast was such a hit that the recipe was switched to an ale. 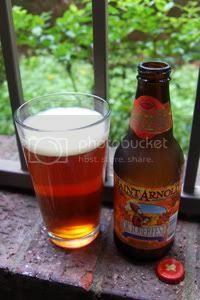 Believe it or not, but this is the last remaining Saint Arnold year-round or seasonal beer to be reviewed here on PintLog. Until they release something new, the only Saint Arnold reviews left to post are Divine Reserve releases. Let's see if they can go out on a high note. Appearance: A barely hazy, reddish-orange body capped by a little less than a finger of bubbly and tannish head that recedes quickly and leaves little lacing. Aroma: Lots of rich caramel malt accompanied by fruit, mild spice, nuts, and a hint of smoke. Taste: A mix of dark fruit, mildly bitter and earthy hops, nuttiness, and just a hint of dark chocolate over a solid caramel malt backbone. The aftertaste features rich cereal grains and a hint of earthy hops. Drinkability: Very drinkable, this would be a great choice for the dinner table or the beer garden. Verdict: A solid Märzen, Saint Arnold's Oktoberfest is a tasty and drinkable taste of fall. Something to look forward to each year, like most of this brewery's seasonal releases.